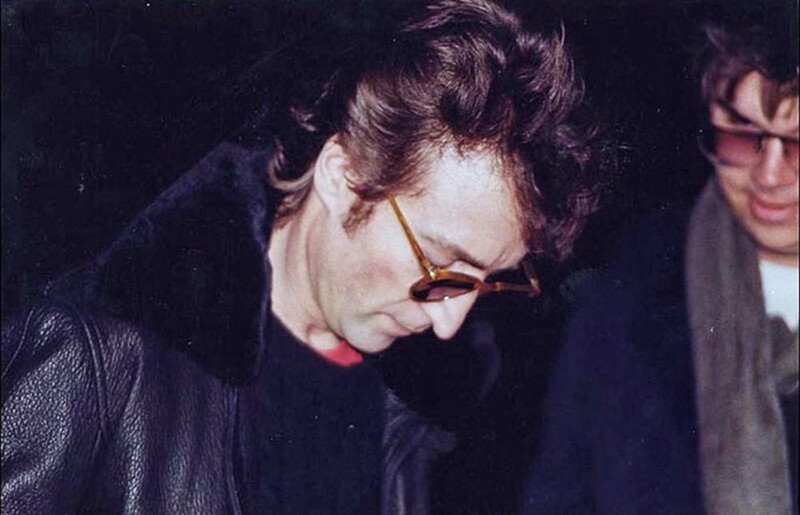 Lennon (left) signing a copy of Double Fantasy for Chapman several hours before the murder. According to Chapman he actually had the gun in his pocket when this photo was taken, but he chickened out. He hung around in front of the Dakota getting his nerves up until John and Yoko came home later that night. Chapman waited outside Lennon’s apartment beginning in the afternoon. Lennon and Yoko walked outside to go somewhere and Chapman asked him to sign his record (it was a special edition record, somewhat rare for one reason or another). After Lennon signed the record he asked Chapman “Is that all?”. Basically asking if Chapman wanted anything else signed to which Chapman replied “No”. Chapman then waited outside of Lennon’s apartment for Lennon to return. He waited several hours and spent some of the time waiting reading The Catcher in The Rye (a book he was infatuated with). Lennon was returning from the recording studio that night. He was carrying tapes from the studio under his arm when he was shot. Chapman then read more of his book while waiting for the police to come. The first to respond after the shooting was a security guard from The Dakotas (the apartments John and Yoko lived in) who approached Chapman as he sat reading. Apparently the all the security guard could do was sob and kept asking Chapman “Do you know what you did?”. Mark Chapman was an individual who had experienced many problems, that were left unchecked and allowed to escalate. He heard voices and had obsessive thoughts about things, including Catcher of the Rye by J. D Salinger. He had grown up idolizing Lennon, but after becoming a born-again Christian he was angered at the singer’s claim that the Beatles were “more popular than Jesus”. 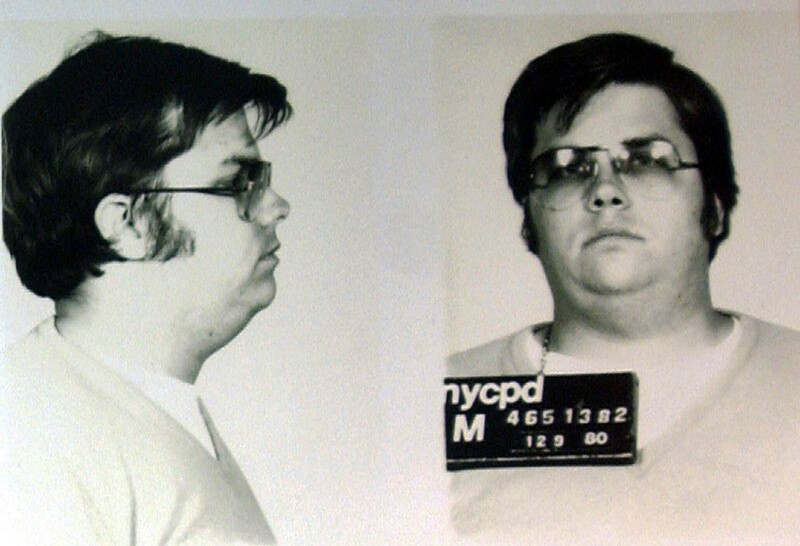 He had intended to kill John Lennon in October 1980, after he had made the trip to New York with the intention of carrying out his plan, but he was delayed and instead went to Atlanta to purchase ammunition from a friend. He returned to New York again in the November, again fully intending to kill Lennon, however changed his mind after seeing the film Ordinary People. After he returned home to his wife in Hawaii, and he told her that he had been obsessed with killing Lennon, and the matter again went unchecked by psychiatrists and other such professionals. Chapman would return to New York one last time on December 6, with his plan to kill John Lennon firmly back on schedule. He checked into the Sheraton Hotel, staging his hotel room with several personal items for the police to find after he killed Lennon. He purchased a copy of The Catcher in the Rye, and wrote inside the cover: “This is my statement” and signed it Holden Caulfield. 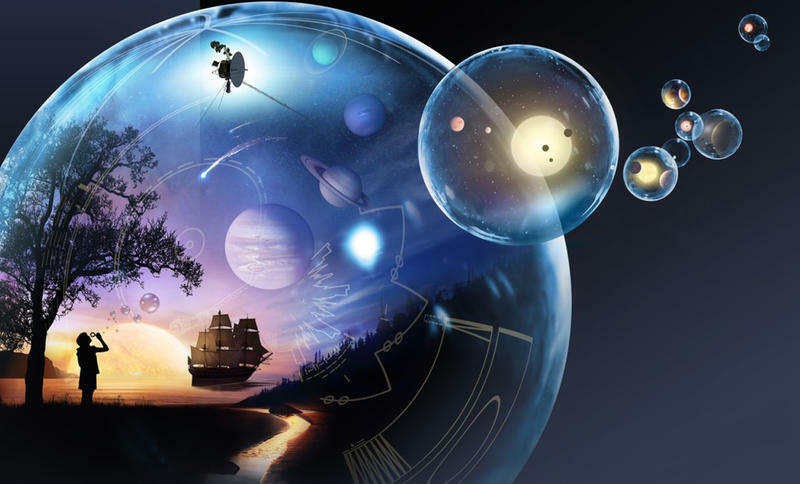 I would listen to this music and I would get angry at him, for saying that he didn’t believe in God… and that he didn’t believe in the Beatles. This was another thing that angered me, even though this record had been done at least 10 years previously. I just wanted to scream out loud, ‘Who does he think he is, saying these things about God and heaven and the Beatles?’. Saying that he doesn’t believe in Jesus and things like that. At that point, my mind was going through a total blackness of anger and rage. So I brought the Lennon book home, into this The Catcher in the Rye milieu where my mindset is Holden Caulfield and anti-phoniness”. Chapman had decided that taking the life of someone so famous would, finally, make his life meaningful. He would later go on to say: “I felt that by killing John Lennon I would become somebody and instead of that I became a murderer, and murderers are not somebodies”. How the incident happened? Around 5:00 p.m., Lennon and Ono left The Dakota for a recording session at Record Plant Studios. As they walked toward their limousine, Chapman shook hands with Lennon and asked for him to sign a copy of his album, Double Fantasy. [ Photographer Paul Goresh took a photo of Lennon signing Chapman’s album. Chapman reported that, “At that point my big part won and I wanted to go back to my hotel, but I couldn’t. I waited until he came back. He knew where the ducks went in winter, and I needed to know this” (a reference to The Catcher in the Rye). Around 10:49 p.m., the Lennons’ limousine returned to the Dakota. Lennon and Ono got out, passed Chapman and walked toward the archway entrance of the building. From the street behind them, Chapman fired five shots from a .38 special revolver, four of which hit Lennon in the back and left shoulder. The death certificate gives the following description: “Multiple gunshot wounds of left shoulder and chest; Left lung and left subclavian artery; External and internal hemorrhage. Shock”.